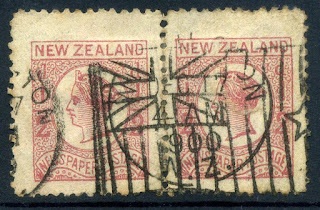 Virtual New Zealand Stamps: 1900 The Wellington Flag. The Wellington Flag is a machine cancellation that appeared in 1900 as New Zealand was celebrating the turn of the century. It does not seem to have been used in any location other than Wellington, hence it normally referred to as The Wellington Flag. 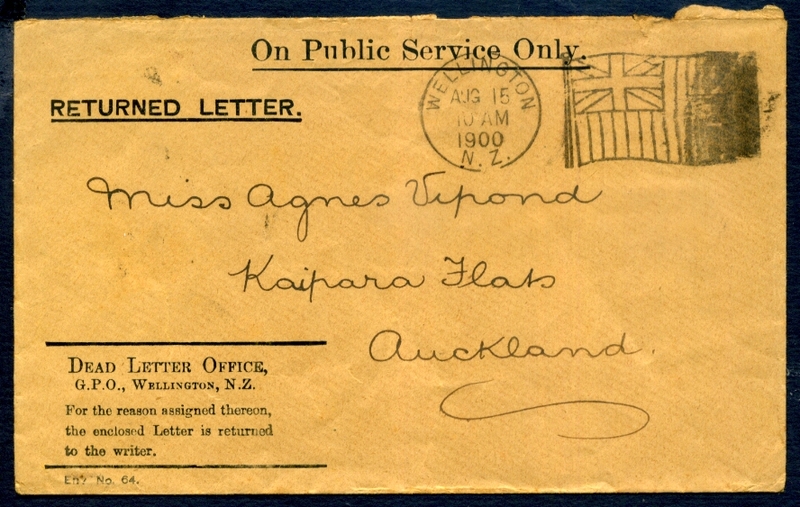 The cancel shows the Union Jack in the top left corner with the four stars of the Southern Cross against a vertical lines background. In the centre of the stars are the large letters 'NZ' for New Zealand. The design even features a wave as if its being moved in a gentle breeze. I believe the date and Post Office name was part of this cancel as it appears in exactly the same location in every example I've seen. Now this cancel first captured Allan and Mary's interest when they found it on a couple of stamps that had been removed from issue long before this cancel appeared. These are shown again at the bottom of this page. One day recently it was suggested that we should go back and try to find more about this cancel. I was given the task and my answer to that is not much, other than what has been said above, but what I did find were some very interesting covers. I hope these will go some way to telling us more. We invite anyone who knows more to contact us via a comment below. State "Non-Publish" if you don't want your comment published. 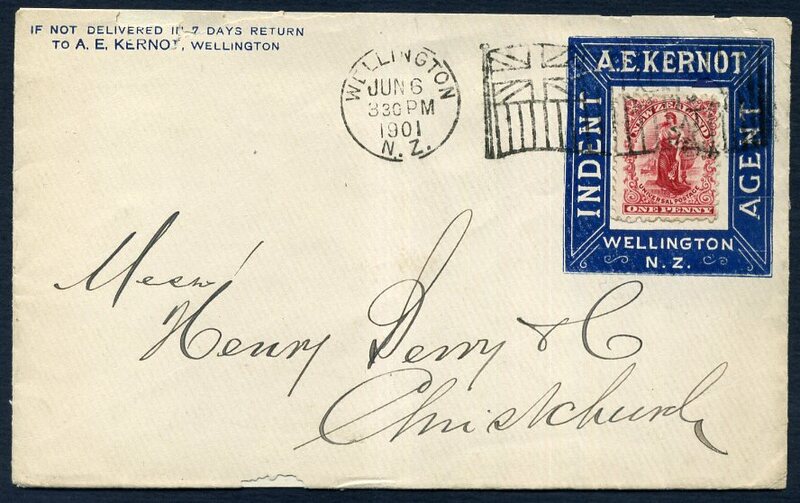 Our first example of the Wellington Flag is on a cover sent on the 10th January 1900. This is a pre-printed cover of an official Government letter, therefore requiring no postage stamp. It appears to have come from the Head office, Taxation Department, Wellington. The cancel is almost complete with only the bottom star of the southern cross missing. A good clear date is shown too. 1900 1½d Queen Victoria Lettercard sent from Hawera on the 7th April, 1900 to Dunedin by Railway via Wellington. The Wellington Flag Machine cancel shows it passed through Wellington on the 8th of April and arrived in Dunedin on the 10th of April. Notice that the stamp is pre-printed on the lettercard. 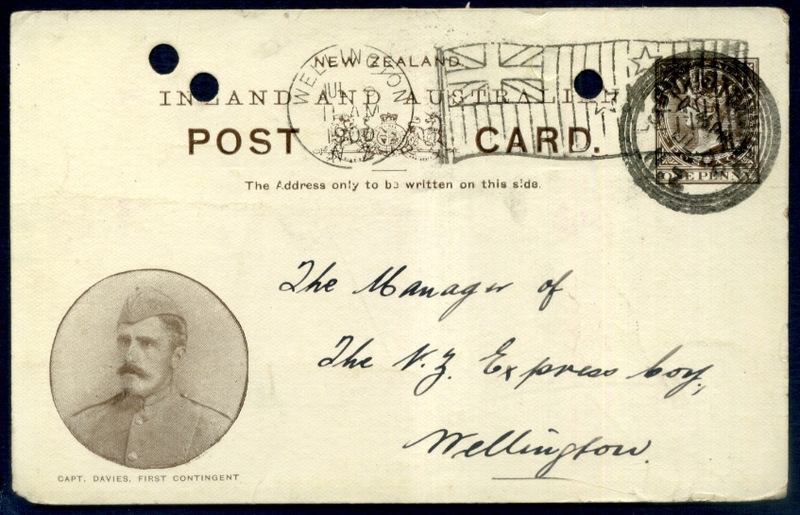 Our next example is a postcard sent from Wellington to the New Zealand Express Company dated 6th of July, 1900. The stamps issued by this company Express Delivery - Revenue Stamps. It is a good example of the Wellington Flag although the date is rather hard to read because of the pre-printed coat of arms/logo. Down in the left corner is Captain Davies a member of the first group of New Zealanders to fight in the South African Boer War. Now the colour of the stamp on this cover is a bit confusing. When I tried to identify it I decided that it had to be one of the Sideface 1d stamps seen below. But while it looked like the lilac 1d of the 1st Side Face issue the colour appears to be different. When I brought it to Mary and Allan's attention and they both say that these early stamps did change in colouring as they aged, but in this case, it appears this stamp may have been pre-printed as its the same colour as the words "Post Card." It's amazing what you learn doing posts for this blog. 1d - 1st Side Face Issue. 1d - 2nd Side Face Issue. Sent on 15th August, 1900, this OPSO (On Public Service Only) Returned Letter envelope, sent Wellington to Kaipara Flats via Auckland, Warkworth. The machine printed cancel only shows part of the flag, turning into a smudge soon after the Union Jack. For some reason it never reached the person it was addressed to and eventually got returned to the sender. 1900 OPSO Cover send 28th June, 1900 to Rata from Wellington. The front shows a very good example of the Wellington Flag, one of the best on this page. This example has also been signed by a Post Office official as well. The back below tells the story of the letter's progress from the city of Wellington to Palmerston North on the 28th, reaching Marton the following day, 29th. 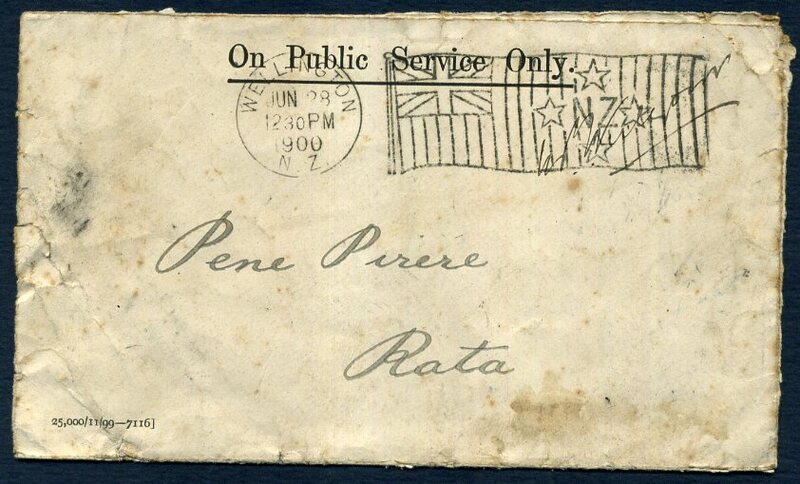 The date stamp for the small location of Rata is very hard to read but the clear "2" leads me to believe the cover must have arrived in the afternoon of the 29th of June, 1900. A 1901 advertising cover from A. E. Kernot Indent Agent Wellington, featuring an advertising type box around the stamp. The stamp is the 1901 1d Universal with the Wellington Flag machine cancel dated 6th of June, 1901. In this case, much of the cancel is hard to see due to the advertising underneath. 1898 - The First Pictorial Issue. The stamps shown here were from the 1900 Pictorials. Both designs had originally appeared in the 1898 Pictorial issue but were changed for the 1900 issue. 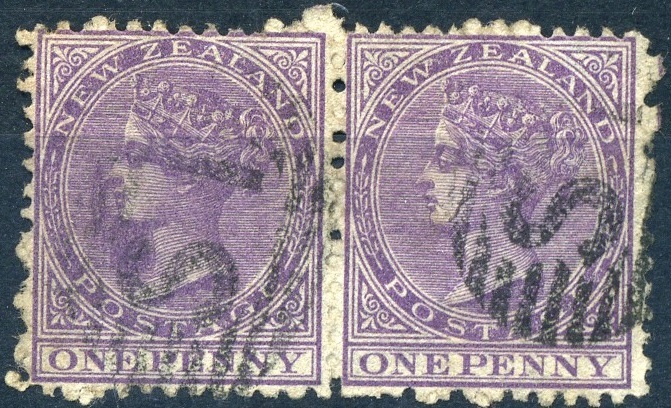 The ½d was a colour change required by the Universal Postal Union and the 1d was a re-drawn design being reduced in size and changed from its original 4d value. Of course, the reason it's included here is it's a good copy of the Wellington Flag. 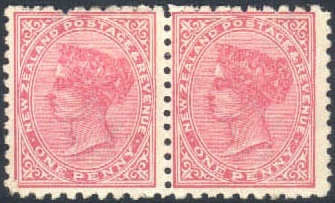 This pair is from the ½d Newspaper Stamp issue of 1873. 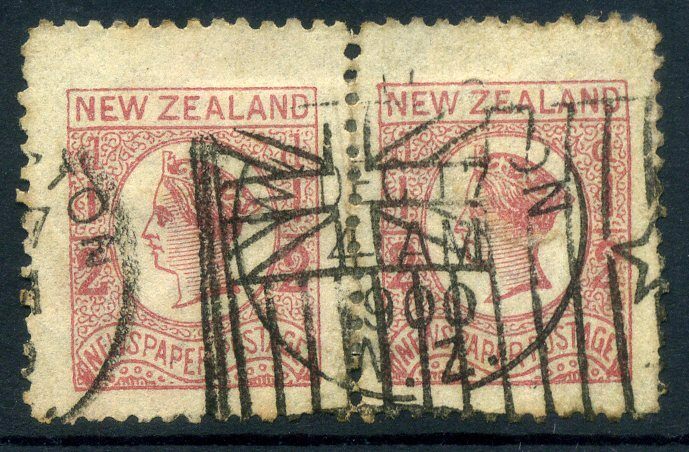 What makes this pair of interest is a stamp that was believed to have been withdrawn from sale many years earlier has been cancelled with the 1900 Wellington Flag. In 1895 the ½d Newspaper was had been replaced by the ½d Queen Victoria Second Sideface. Mary believes it is possible some could have been around five years later in 1900. 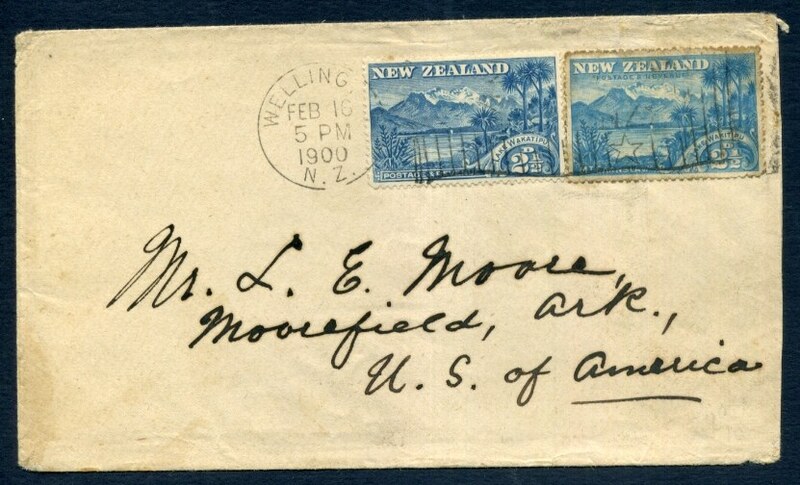 1898 2½d - Lake Wakitipu/Wakatipu error. 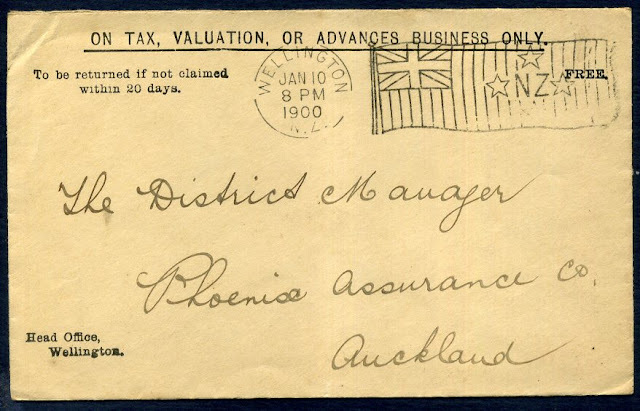 1898 - New Zealand's First Variety (Error). I am not sure that this is real in the sense that these two stamps were placed on this cover together by accident. 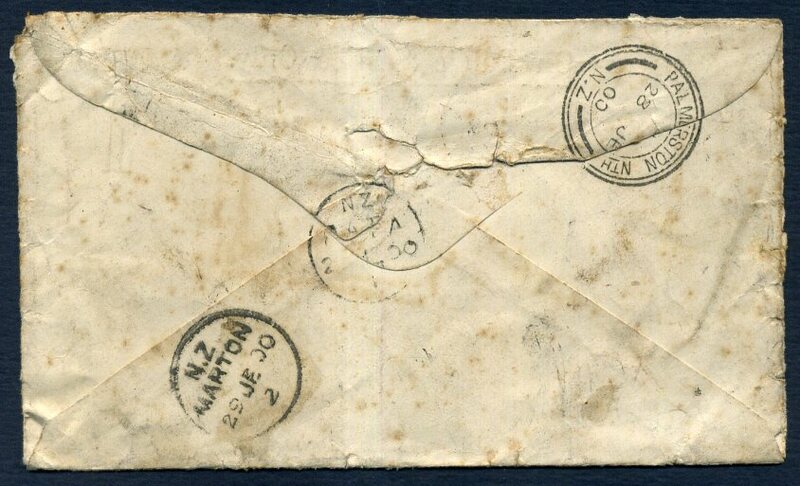 The postmark dated 18 Feb, 1900 is a dead give away. The condition of the stamps. one being clean and the other one dirty also points to this being put together for a collector in the USA. Finally, take a close look at that cancel over the stamps. Of course what is of interest to us on this page is the Wellington Flag across both stamps. Paul! Who let you in here. 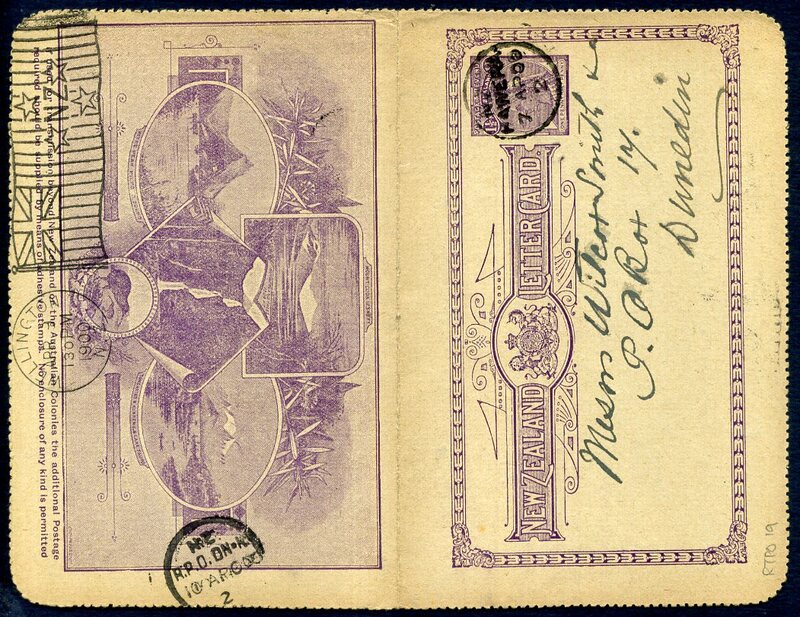 This is a blog for those who appreciate the beauty and history of stamps. Those with a bit of culture and class some might say. Do you realise the importance of what you said above? Here is a page on which everything is at least 115 years old. Amazing isn't it? Its about finding these items and displaying them so others can enjoy them. Oh Anne - Play nice! "So that stamp above is the most expensive New Zealand stamp. Wow I could think of much better things to spend $200,000 on than a scruffy bit of paper. LOL But I suppose bragging rights to say, "I have the only one!" might be worth it to someone." Go read it - Tuesday, 12 August, 2014. 1900 4d Lake Taupo Invert. Paul the thought come to mind, did you find that yourself or is there someone making the bullets for you?